Embarking on something new often comes with trepedation, anxiety, nervousness and fear. Well, for me, finding and collecting a new watch maker feels nothing like that - I'm just downright excited. 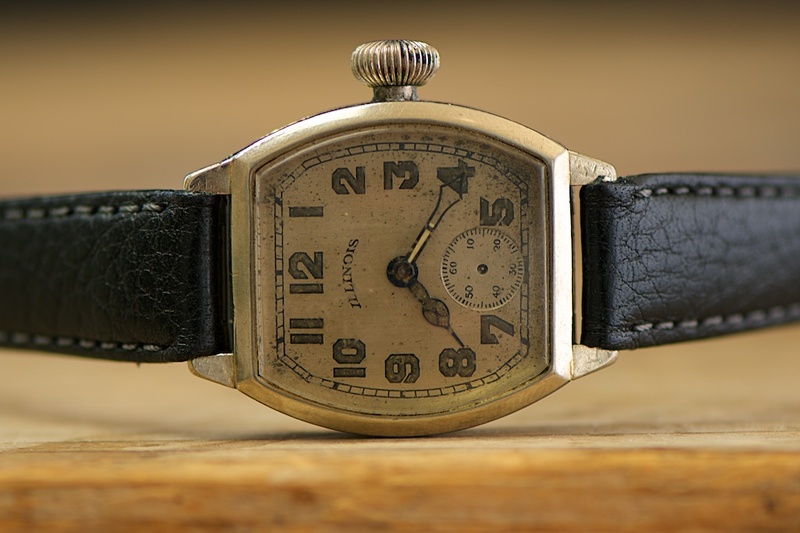 Welcome to the family of watch makers I collect - the Illinois Watch Company. 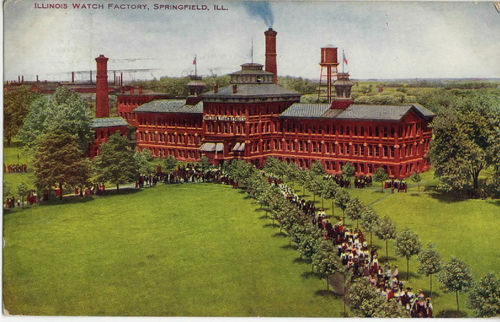 Originally incorporated as the Springfield Watch Company in 1869, the Illinois Watch Company produced pocket and strap (wrist) watches until 1927 when the Hamilton Watch Company purchased the company. A casualty of the great depression, production of the Illinois brand ceased in 1932.
named after one of the original company founders. 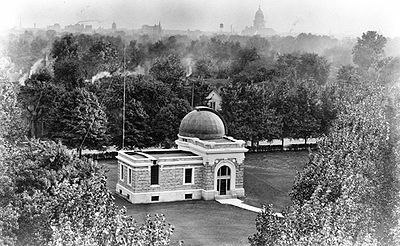 Like many watch manufacturers of the day, Illinois built its own observatory in order to test its timepieces accuracy. The observatory became a symbol of the company, used often in its marketing materials. I was introduced to the Illinois brand via a vintage watch forum website that I've mentioned in previous blogs. 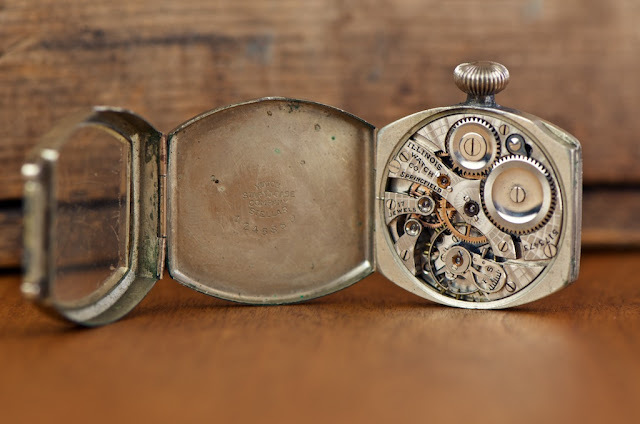 The case and dial stylings are what drew me to this manufacturer. 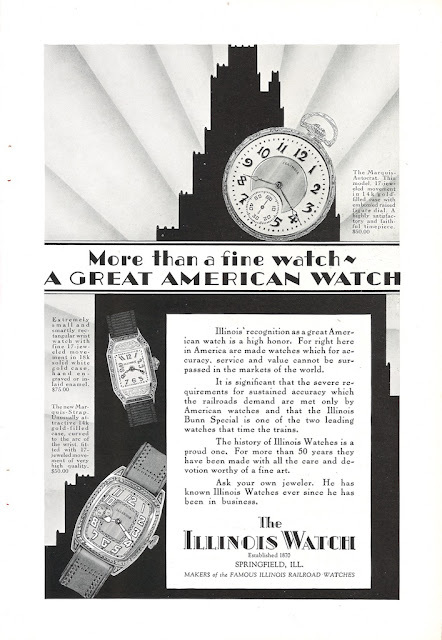 Further research led me to Fredric J. Friedberg and his book and website "The Illinois Watch - the life and times of a great American watch company". Fred is currently working on a four-volume "sequal" to this book. 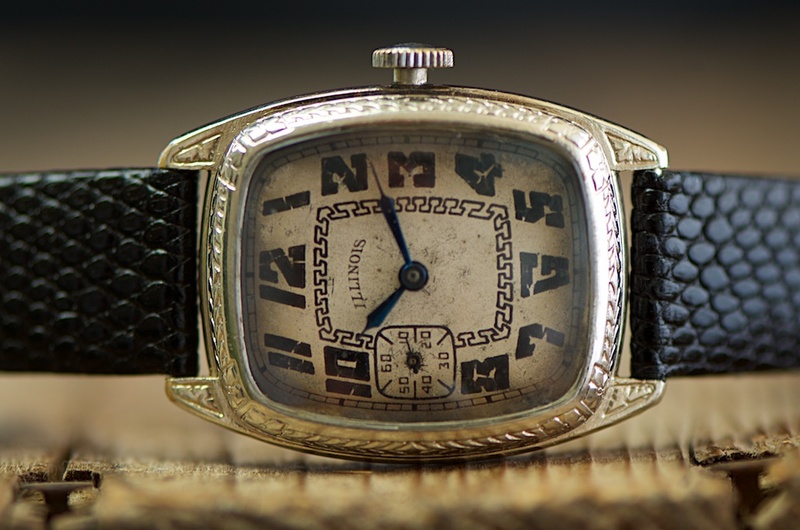 My first Illinois watch comes from Fredric Friedberg - the Marquis featured in the ad above. The watch does not feature its original hands and I've had to use a temporary stem and crown to wind and set the watch. Of course a new collection is not a collection with only one. Joining the "Marquis" in my collection are a "Beau Royale" and "Whippet"; both of these from Fred as well. The Whippet is waiting on my bench for restoration. The Whippet below features its original hands and crown. I understand these types of crowns, shaped and referred to as a pumpkin, are very hard to find. Crowns typically get worn out and replaced during a watches life. My Marquis and Beau Royale are missing their original crowns. Inside the Whippet - it could stand a good cleaning. While I admit no trepedation, anxiety, nervousness or fear about branching out on my collection, a new manufacturer does come with its own challenges with accessing spare parts and learning how they go together. But at the end of the day, I welcome Illinois to my watch family with open arms and after much time with looking and reading, its about time these watches joined my collection. 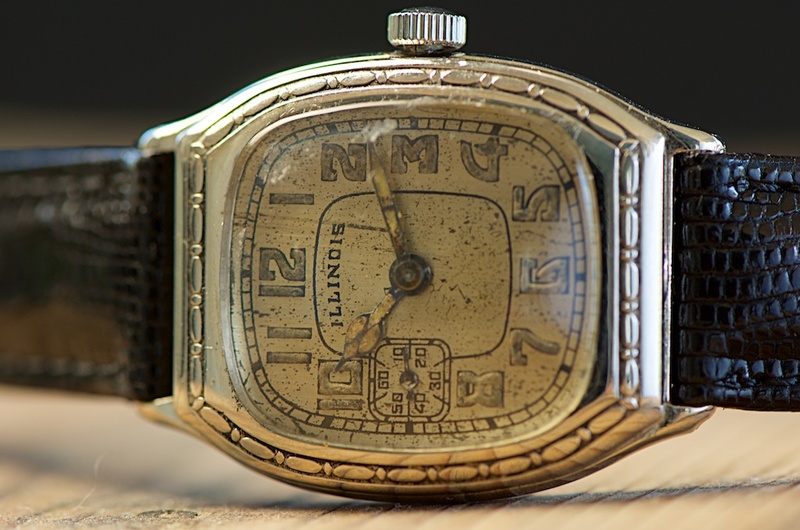 Illinois watches are some of the best Art Deco watches you will ever see. Your examples are wonderful and the brand is very addicting. I bought my first Jolly Roger years ago and never stopped. 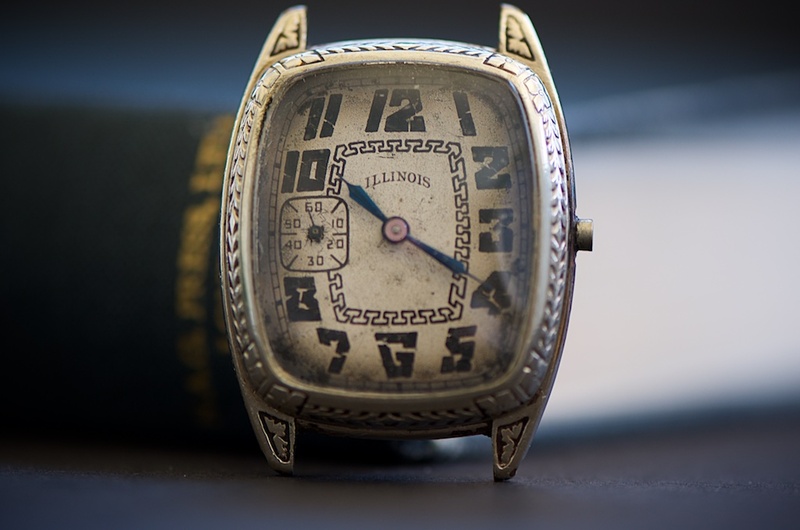 Fred Friedberg is a wonderful source for these watches and he is coming out with a new 5 volume book set that will be a must have for any Illinois collector. Keep up the collecting, wonderful pieces! Hey Greg. I look forward to Fred's book. Fred has been the supplier of these great watches I've picked up!